The National Reconciliation Commission (NRC) wound up its operations officially last Friday with the expression of satisfaction that its members had completed their task on schedule. Members of the commission also expressed their unwavering confidence in the attitude and work ethics of the staff that enabled them to complete work on schedule. 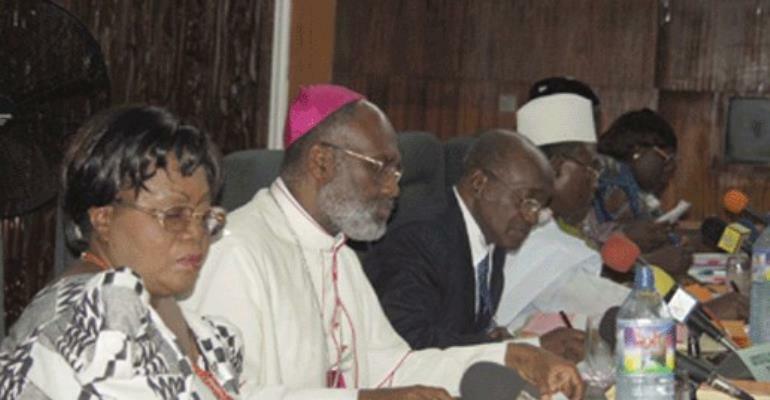 The members also expressed the hope that the staff of the commission would continue to exhibit the same level of commitment and honesty, wherever they would find themselves.Interacting with members of staff, the chairman, Mr Justice Kweku E. A. Amua-Sekyi, noted that some of the happiest moments for him at the commission was when alleged perpetrators and victims showed signs of reconciliation during the hearings, which signified the capacity of Ghanaians to reconcile. He urged the staff to learn from the experiences gained at the commission and help prevent the repetition of mistakes made in the past.He noted that even though most members of the commission and staff were strangers to each other when the exercise began two years ago, they all had worked together as a team to successfully complete the work. Mr Justice Amua-Sekyi said the wisest decision taken, with regard to the work of the commission, was the invitation to retired and experienced police officers to serve as investigators, who had proved most active, travelling the length and breadth of the country to investigate petitions. Prof Abena Dolphyne described members of staff as being so helpful and honest with their work that no leakage emanated from the commission. She asked the staff to take a cue from the experiences of alleged victims at the commission and deal with all manner of people with respect as contemporary human rights cut across a broad spectrum of areas. Dr Sylvia Boye said all members of staff had proved their worth as Ghanaian citizens through their attitudes that had resulted in team work and the successful completion of the commission's mandate. Prof Henrieta Mensah-Bonsu advised members to learn from some of the testimonies heard in the chamber of the commission and take an interest in the rules that governed employment in organisations where they found themselves. Bishop Charles Palmer-Buckle expressed his gratitude to the staff and the chairman of the commission, who, he said, had exhibited extraordinary and sterling leadership. He pointed out that the heritage of members and staff was the relationships that had been created as they worked together as a team.“If you had not been what you were to the commissioners,we would not have succeeded,” he stated. He pointed out that at the end of its work, the commission could stand tall and say that Ghana was capable of delivering on tasks. General Emmanuel Erskine told members of staff that they were all part of the country's history. He said what sustained them as they worked was the belief that what they were doing was in the best interest of the country. He also commended the chairman for his leadership, which he said had been an important factor in the fulfilment of the commission's mandate.Mr Christian Appiah-Adjei, noted that the history of reconciliation commissions the world over showed that Ghana had been successful with its process. Thus, there was the need for rejoicing. He also reiterated the fact that as far as the commission was concerned, the report of the work was still confidential.The Ameer and Missionary of the Ahmadiyya Muslim Mission, Maulvi Wahab Adam, was grateful for God's Grace in the completion of the work at the commission. He told members that whatever they put in, whether appreciated or not, would be judged by the Almighty. The Executive Secretary of the commission, Dr Ken Attafuah, said it was a privilege to have worked with the members and staff of the commission.He said standards that emanated from the chairman and members of the commission had been necessary for the success of the work of the commission. He advised the staff to protect the integrity of the report when it was made public.A staff of the commission, Mr John Kennedy Ayivi, donated 10 copies of the prayer of the commission to each member of the NRC.The staff were later given certificates for their meritorious service to the commission.